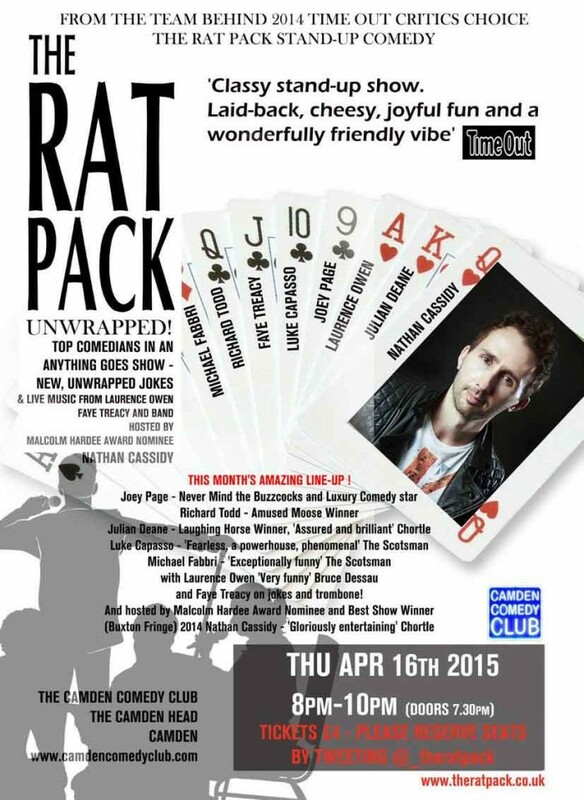 2014 Time Out Critics Choice and Edinburgh sell-out hit The Rat Pack stand-up comedy now has a spin off show – The Rat Pack unwrapped! New, unwrapped jokes and live music from Laurence Owen, Faye Treacy and band and the freewheeling, anything goes atmosphere of a Rat Pack show – look out for the latest bills on our website www.theratpack.co.uk/unwrapped. Our main shows continue during 2015 at the Leicester Square Theatre. Hosted by Malcolm Hardee Award nominee and Best Show Winner Buxton Fringe 2014 Nathan Cassidy, ‘a great comedian’ – Broadway Baby. Start spreading the news! FAYE TREACY – Musical Comedy Awards Semi-finalist 2015 on trombone!